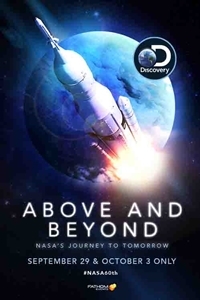 Fathom Events and Discovery Channel are partnering to bring NASA: Above and Beyond, to select cinemas for a two-day event. As NASA celebrates its 60th anniversary, Discovery shines a spotlight on the historic institution taking us to the moon, to the surface of Mars, to the outer edge of our solar system and beyond. Above and Beyond celebrates NASA's many accomplishments in space and catapults viewers forward to where it's headed in the future. Directed, produced, and narrated by Academy Award®-nominated and Emmy®-winning Rory Kennedy ("Last Days of Vietnam,") the film examines the extraordinary ways NASA has changed not only our vision of the universe, but also our planet, and ourselves.